If there is one sort of office that is often drowning in paperwork, records and documents, it is a medical office. There are many reasons that these paper records are kept, but there are now far better options than lots of filing cabinets and highly specific filing systems. One of the best is the use of medical records scanning solutions from premium providers of these services. The very best of these services will be able to guarantee you remain HIPAA compliant at all times and that the documentation is handled with expertise, confidentiality and the utmost in security. In fact, if you choose the best, they will offer services such as file pickups, proper destruction of documents (if needed), and even file sorting before scanning. The naming of files is also an important factor when using medical record scanning solutions, otherwise you have to assign staff to manually organize hundreds or thousands of files. The good news is that the best providers also do this according to your criteria. They can also manage archival files. For example, old practices may have kept old records rather than destroying them after a specific span of time. If that is the case, rather than purging them permanently, scanning is a better option. The end result of the premium scanning solutions is a cloud-based variety of storage or encrypted media to be used with your servers. If you choose online storage, though, you can also share files across offices or locations, update and synchronize files and more. If you are eager to learn how medical records scanning solutions can be put to use in your facility, contact eRecordsUSA. Their team is adept at making entirely customized solutions for their clients. Whether it is digitizing one year of records, reports and results or many, they have what you need. 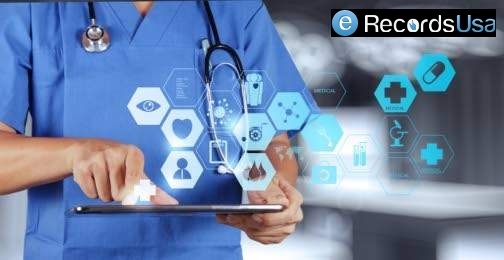 eRecordsUSA is also specialized in providing Medical Records Scanning Services, Medical Records Imaging Services, Medical Records Digitizing Services, Medical Records Digitization Services, Medical Records Archival Services, Medical Records Archiving Services and more. Would you like to receive a free quote for Medical Records Scanning Solutions? Call +1.855.722.6669 or eMail us at info@eRecordsUSA.com.